With Valentine’s Day right around the corner, we are pretty sure you’ve already started preparing a beautiful surprise. How does a love pearl gift set sound to you? We think this post will save you from the time-consuming task of looking for the perfect gift. Let’s face it. Spotting Valentine’s Day gift ideas should be easy breezy, right? But it’s not always easy to surprise our loved one, even when you know her well and you have exchanged a lot of gifts. With our love pearl necklace gift sets and earrings, Pearls Only wants to give you some useful tips and send the pressure away. Romantic gifts, elegant gifts, thoughtful gifts, simple gifts, they are all appreciated. Read more to find out what wonderful option we have in store for you and why gifts actually matter. If you fancy giving your partner something a little more that flowers and candy, then pearls are the right choice. Trust us. Without any doubt, they have a timeless elegance and beauty. Real pearls are well worth the investment because, unlike faux pearl jewelry, they will pass the test of time. They will remain just as charming and chic throughout the years. No one can resist a beautiful love pearl necklace gift. This kind of gift encompasses everything you want to express through it. Moreover, it reflects what you know about the woman you love. Next, we will show you some elegant Valentine’s Day gift ideas appropriate for this occasion. With this occasion, you can also check our Valentine’s Day gift deals that we have right now. Some of the products that we plan to show you are part of the Red Tag special offers, so you might take advantage of the discounted price. With a love pearl gift set like the ones below, you are obviously making a statement. Totally appropriate for this kind of occasions, a pearl jewelry set is an absolutely marvelous gift. Especially if you are together for a long period of time and you want to mark this moment with a special present. Real pearls remain the true standard of beauty. Plus, they accentuate women’s feminine features in a very delicate way. They come in a wide variety of colors and sizes so there are quite a few excellent choices out there. For example, this love pearl set in Katie Heart Black (we also have in White) is perfect for the woman who enjoys a bit of mystery in your relationship and always knows how to spark the passion. the crossing of the heart shows the love in the large black Freshwater Pearl and Sterling Silver set. With one single gift you are actually giving her three options to style her outfits. Next, you can never go wrong with a white pearl set. They are perfect for the ladies who Show the woman you love how precious she is with a complete set: a white pearl necklace, a pair of earring studs, and a pearl bracelet. The pearls are separated with a hand tied double knot to ensure that no two pearls can rub, touch or damage the shape or luster of each other. The delicate shade of creamy white of these perfectly round freshwater pearls makes this love pearl gift a touch of grace that can be paired with virtually any kind of attire. She can wear it all throughout the day, so this is a total plus. A love pearl necklace gift set is an exquisite option is you want to show her that you are paying attention to her own style and jewelry tastes. If she is the type of woman who appreciates simplicity has a clean elegant sense of style, then she would love any of our recommendations. A love pearl necklace gift like this one below is truly unique and exquisite. Flawless and unblemished, the white pearl adds a touch of stately beauty without distracting from the young and chic vibe of the Love necklace. We love and recommend pearl pendants because they are the embodiment of good taste and they can add a touch of refinement even to the simplest outfit. Just as necklaces, they have the same power to accentuate her femininity. Does she prefer something more sophisticated, with a more modern design? Here you have some other great options. The Coco pendant is a truly amazing pearl pendant with an open-heart design. The woman receiving this adorable heart pendant will think of you every time they wear it. How about this Japanese Akoya Pearl Pendant in Randy White? It can surpass the expectation of many and can compliment anything she can pair it with. The magnificent sparkly heart will instantly make her smile. If your sweetheart prefers golden tones, then this pendant in Nelia gold is the pearl gift that literally says “love” all over it. Say “I love you” with this dazzling South Sea pearl ! One heart or two hearts? 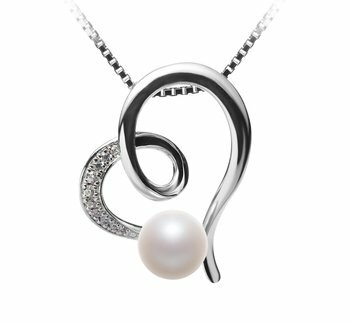 How many can you see in this love pearl pendant in Cora White? A symbol of your love, this pearl pendant in Amber White will make her heart melt. Surprise her with a truly romantic love pearl gift, just as delicate and graceful as she is. Who wouldn’t love hearts and pearls in the same pair of earrings? They are extremely delicate, chic and easy to wear. She could even wear them at the dinner date 😊. The pearl earring pair in Hedda White is a sophisticated love pearl gift set. The white pearl is a symbol of purity and grace, therefore your partner will fall in love with them too. These earrings are true showstoppers that transform any formal event into a special one. You can be sure your beloved one will receive a lot of compliments. Oh, and doubtlessly, the decorated hearts with cubic zirconia will send the right message. An absolute joy to look at and appropriately named Heart, this pair of pearl earrings in Hear White is the perfect love pearl gift set for the woman who appreciates fancy pieces of jewelry. They will add an irresistible touch of glamour to any outfit. The shiny silver puffed hearts are just the right dose of romance. Enchant her with this fancy pair of earrings that has a true chance of becoming her favorite pearl accessory. A pearl bracelet is also an outstanding Valentine’s Day gift. Are you at the beginning of your relationship and not quite sure if she prefers classic pearls or modern pearls? For example, this Pearl Bracelet in Harmony White is a fun and flirty one, perfect for the woman who enjoys a more modern design. The semi-round flat drop pearls hanging and the dangling hearts will capture the entire attention. Designed for a casual style, this love pearl bracelet will bring lots of smiles. For the woman with a more classic taste in pearls, here is a sophisticated and elegant freshwater pearl bracelet. Luxurious, yet extremely affordable, this white pearl bracelet has a timeless beauty that is able to represent her true self. The 7.5-8.5 pearls are a great choice for any age or occasion, therefore they will shine delicately on her wrist. The Valentine’s Day gift can be considered as any other type of gift that you offer to your lovely woman. It is simply a nice pretext to show your attention and to remind her that you can do romantic gestures. Of course, you may say that you don’t need a special day to do these things and to celebrate your love. You can do this any other day. But most of the times we just get lost in our daily problems, issues that require our time, and if you also have kids, then your time is divided. Usually you don’t find enough time for yourself, let alone for the other. So, pause everything for one day. Take some time to be alone. You don’t really have to give her something. Just give her YOUR time. Reconnect with each other and remind yourselves what makes your love strong. The fact that you are giving her a gift means that you actually thought about her, her feelings. This isn’t just about Valentine’s Day. We are stripping this day away from its commercial aspect. You planning something with the intention to surprise her means a lot more than you can imagine. It’s the actual consideration that you are giving to her and what she means to you. Words are now accompanied by facts. And every woman loves to see little acts of love from your side. Ladies, if you are reading this, you know we are right. Choosing a Valentine’s Day gift or any other gift implies time, preference, vision. You are actually taking some time to think of her and what she likes. And what would you like her to wear or have from you. Picking the final love gift comes after you envisage her wearing it. For example, if you want her to have a gorgeous pearl necklace, first, you’re imagining how would she look like with it, right? So, in the end, all this effort means how much you want her to be happy. Her happiness becomes your happiness. And this is the simple beauty of love. You know you will be happy if your happiness becomes your other half’s happiness. In the end, it’s not about spending money in order to get rid of the “burden” . Surprising your woman should be a wonderful and sincere act. A Valentine’s gift is a gift of love, wrapped with an open heart, chosen according to some particular preferences. A simple gift is able to express how much you care. No matter what you choose, we are certain that your loved one will be amazed. Women don’t care about the value, they value the effort. And that’s enough. Whether you offer her a love pearl gift set, a perfume, a book, a coffee mug, or tickets to see her favorite artist, she will know she means the world to you and that you spent time doing something exclusively for her. She deserves it!